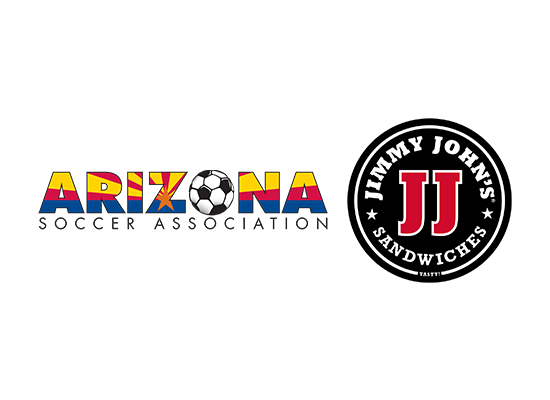 PHOENIX (Monday, March 5th, 2018) -- The Arizona Soccer Association (ASA) today announced an exclusive partnership with Jimmy John's owners in Arizona to promote healthy lifestyles and fitness through soccer. Through Jimmy John's sponsored Recreation and Youth Development Academy Days, which will take place throughout the spring and fall seasons, the ASA will be able to engage approximately 20,000 youth players in Arizona in a sport that teaches discipline, teamwork and sportsmanship while promoting a healthy lifestyle. “Thanks to Jimmy John’s owners in Arizona, we will be able to share our love of soccer to more kids than ever before. We are so lucky to have found a partner that shares our enthusiasm for promoting a healthy lifestyle through soccer,” says Chris Webb, Director of Operations for the Arizona Soccer Association. Youth sports have been shown to positively impact the physical health, social well-being, psychological health and academic performances. Through the spring and fall seasons, this partnership will allow the association to run ten recreation and development academy days to train youth players while teaching them important on and off-the-field skills. “Soccer is an incredible sport that teaches so many life lessons while also promoting healthy habits. We are thrilled to play our part in introducing more children to the game while educating kids on health, active lifestyles,” said Nathan Louer, a spokesperson for Jimmy John’s.